You may recall a couple of weeks ago, my twitter was alive with excitement as Miss OCG and I were kindly invited along to London to visit Pineapple Dance Studios to dance to music from the Annie movie. I couldn’t resist getting my dancing shoes back on after having had such a blast as part of Team Honk at the Comic Relief Danceathon and Miss OCG was beyond excited to be taught some moves from Strictly Come Dancing choreographer, Richard Marcel! As a huge Strictly fan, I was rather chuffed too! 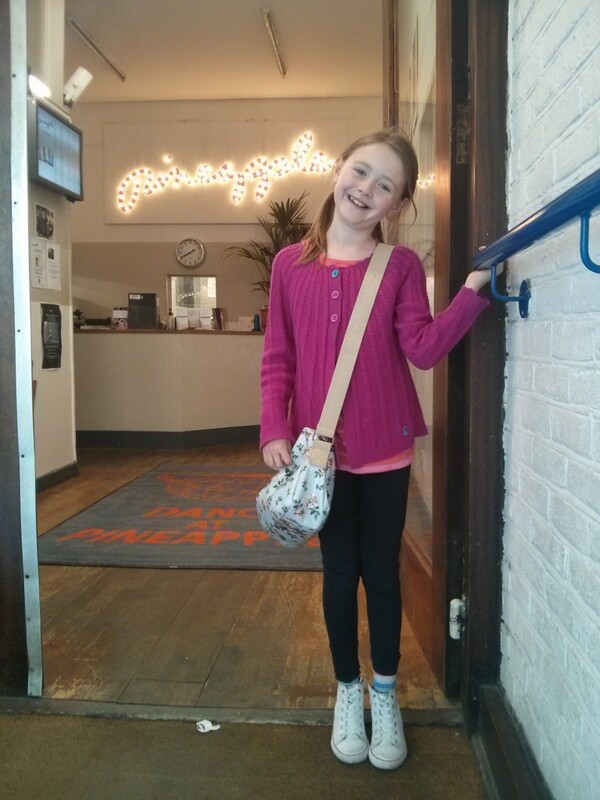 One super excited Miss OCG just before heading into Pineapple Dance Studios! We arrived in London feeling very ‘Fame’ as we entered the Pineapple Dance Studios building! 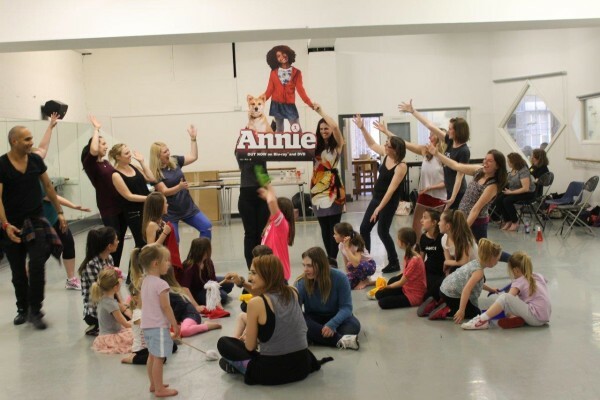 As we made our way to the studio we saw some amazing professional dancers looking fabulous in the middle of their auditions and suddenly wondered whether we were going to be up to the Annie challenge! Miss OCG, looking very happy, with Strictly Come Dancing choreographer and our Annie choreographer, Richard Marcel. But Richard and a couple of his lovely team welcomed Miss OCG and I, along with some other lovely bloggers and their children, and promptly whipped us into shape teaching us a brilliant routine to ‘Hard Knock Life’. I’m sure there were more than one or two of us mums imagining ourselves on the stage set in bright lights waving our jazz hands and doing a high kick or three! It was a LOT of fun! Thanks to Richard’s patience, humour and obvious talents we soon knew exactly what we were doing (OK, everyone else seemed to know exactly what they were doing!) and the little ones were well and truly loving their five minutes of fame! Who knows, there may be a future West End star or Annie amongst them! The smallest children were super cute and the bigger ones put us grown-ups to shame with their musicality! All this fun and frivolity was to mark the release of the Annie movie 2014 DVD which took place today, 27 April 2015 (it’s also available on Digital HD and Blu-Ray). Miss OCG and I loved it when we watched it together. We were toe-tapping away and singing along and I’m certain when we watch it again we’ll be throwing a few moves around the living room with a duster or two to ‘Hard Knock Life’! It’s a fab new film for a whole new generation of Annie fans! 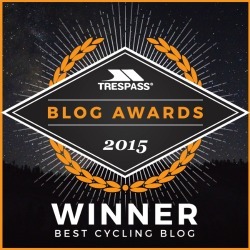 You can take a look here and see what we go up to! 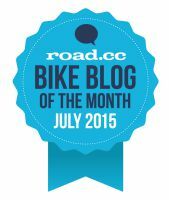 Did you spot us? 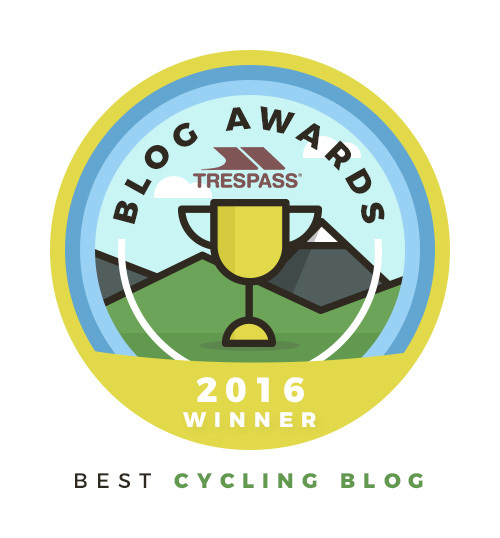 I’m wearing my Plain Lazy grey ‘my other jersey is yellow’ t-shirt from this post and Miss OCG is in a pink and coral stripy t-shirt. 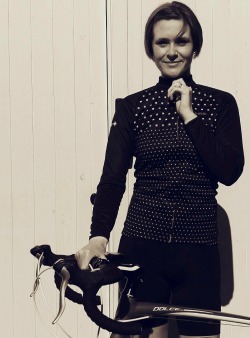 If you’re looking for a fringe…I had it tied back this day! Looking at my moves with the broom, I won’t be giving up the day job! 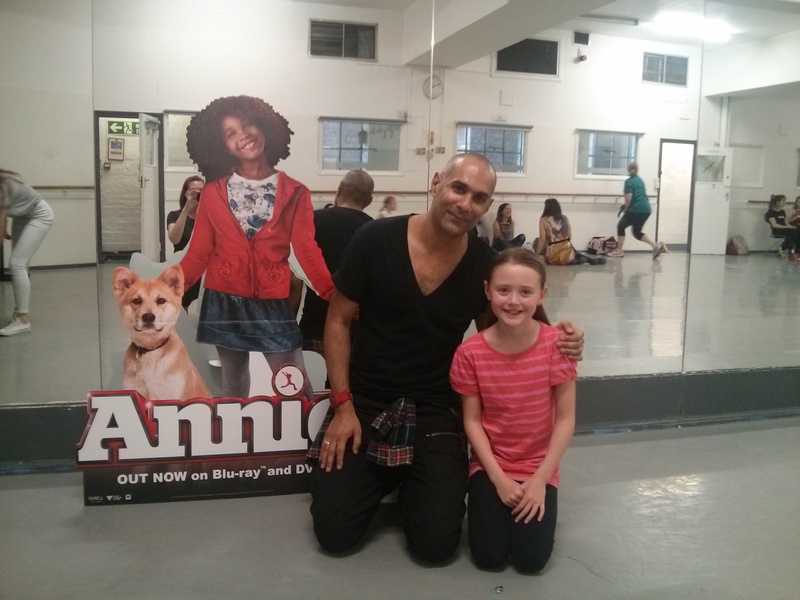 Share the post "The Annie Movie DVD release & Dancing at Pineapple Studios"
Was so lovely to meet you both! And what a fun day!! Although I think I shall never remove the distant sound of broom sweeping from me ears!